If you’re on a keto or low carb diet, you’re probably missing a lot of your old, carb-loaded favorite dishes – and for me, that includes missing bagels so much. I love bagels – especially hot toasted everything bagels – and decided to play around with my Keto Jalapeno Bread recipe a bit to come up with a real bagel I think is every bit just as delicious as my favorite everything bagels – and this one is incredibly low carb keto with NO special flours or crazy ingredients – just cheese, eggs, and Everything Bagel seasoning! This Keto Everything Bagel has less than 1 carbs per serving, making it an excellent easy breakfast choice that will fill you up! I like to serve them with about ¼ cup of cream cheese for spreading – and you can also top them with lox, capers, and other schmears! Since starting a keto diet, my husband has lost over 30 pounds – and I’ve been able to reduce my autoimmune issues greatly to feel much better day to day. 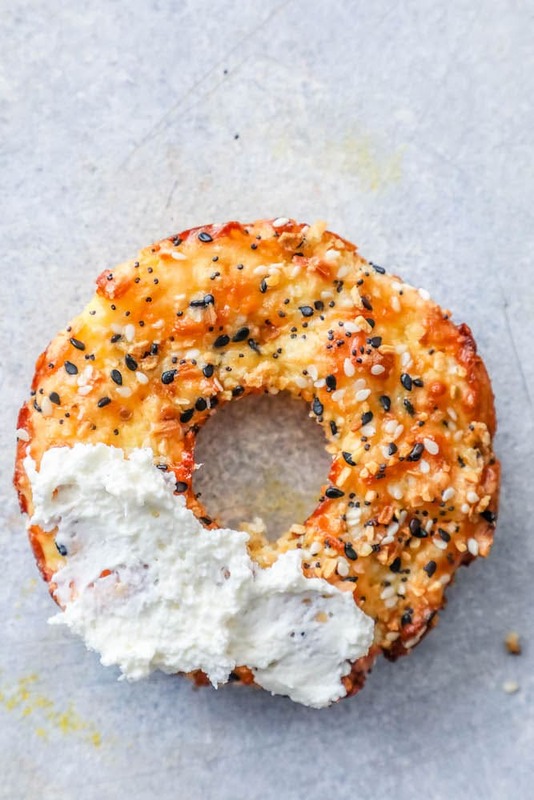 While I love to use it in baking, this recipe does NOT include coconut flour or almond flour – and no egg wash – so it’s an incredibly quick and simple dish that is perfect for an impromptu everything bagel breakfast with ingredients you probably already have on hand. Just mix, put in a pan, bake, and enjoy! 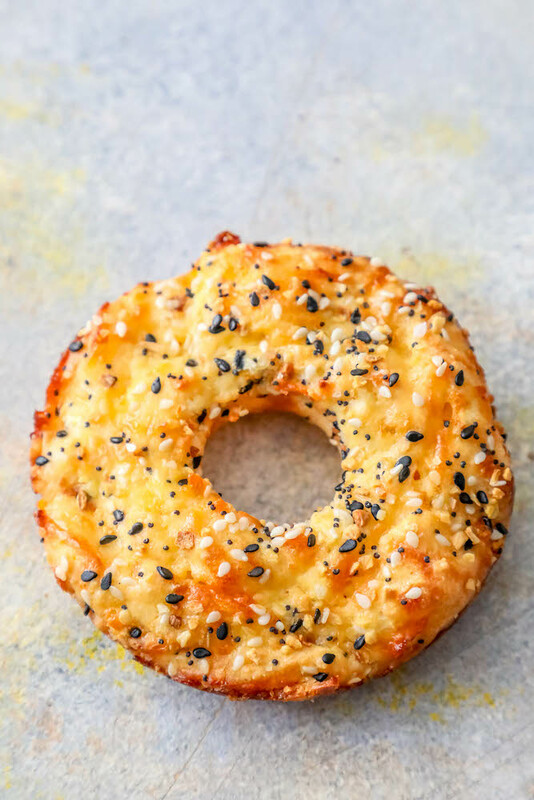 If you love crunchy sesame seeds, poppy seeds, garlic, onion, and sea salt – you’re going to love this delicious Keto Everything Bagel Recipe! It’s even delicious with cream cheese and lox on top for a traditional bagel and schmear spread! 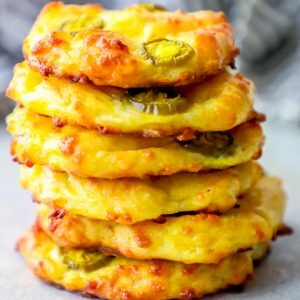 Just Take Me To The Best Everything Keto Bagel Recipe Already! 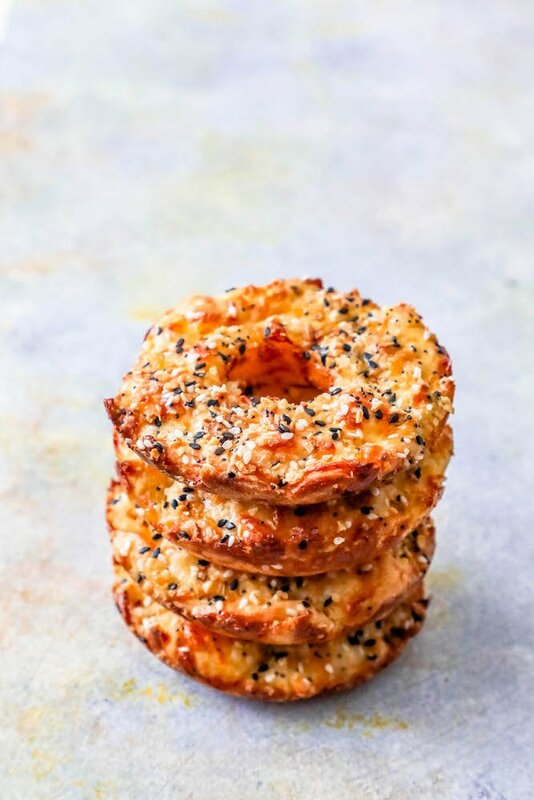 If you’d like to get straight to the recipe and skip my tips and tricks to a perfect easy low carb bagel without any flours, please scroll to the bottom of the page (above the comments) to find the easy printable recipe. I get a lot of questions and comments on posts so I try to add in as much information as I can! 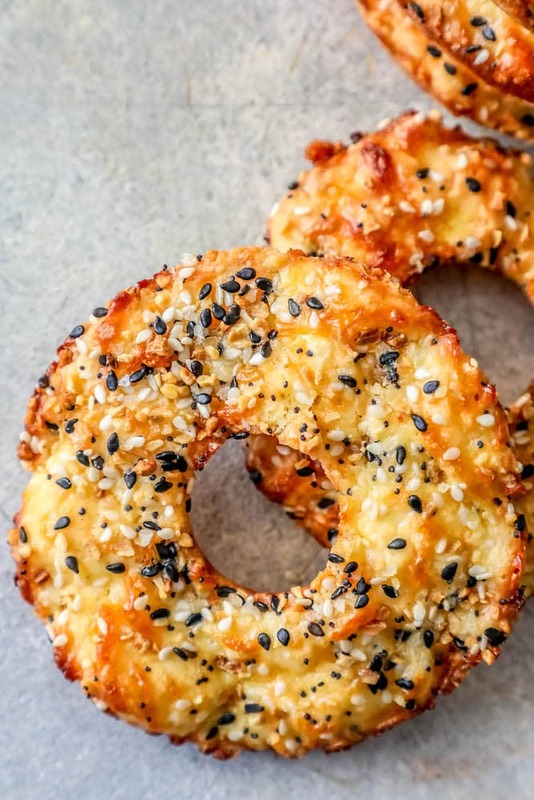 Keto bagels can be made a few ways – but for this recipe, we’re going with the most simple, basic, and easy method – we’re baking a cheese and egg “bread” in a donut pan. Donut pans are usually nonstick coated or made from silicone (the best choice), and can be purchased on Amazon, or found in a local craft store or kitchen specialty shop in the baking section. 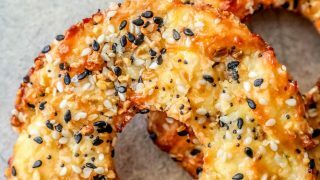 Since these bagels are designed to be quick, there is no complicated setup – just press into the donut pan, bake, and enjoy! 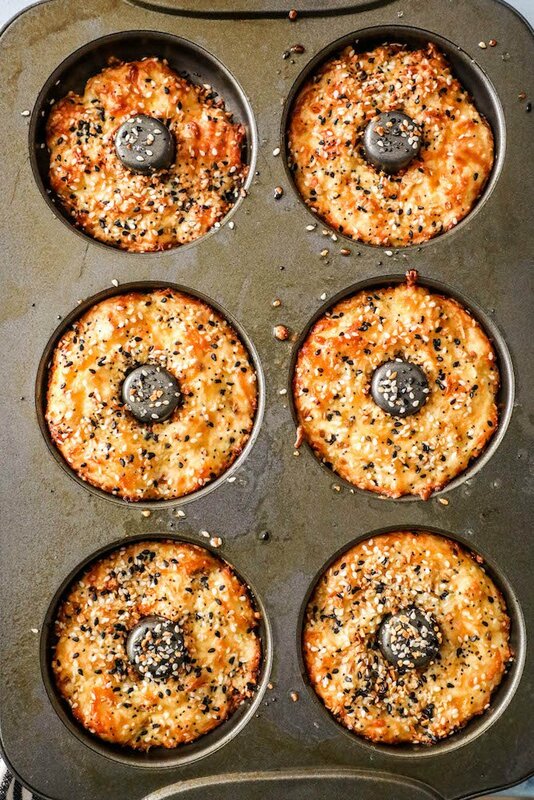 I did find even with preparing the pan with coconut oil spray, my bagels very slightly stuck to the donut pan – but it didn’t ruin their shape or appearance at all. I simply slid a butter knife around the edges of the bagels to pop them out of the pan, and they were perfectly fine. To avoid any sticking, try to use a silicone donut pan. If you don’t have one, like I don’t, the butter knife trick works just fine. 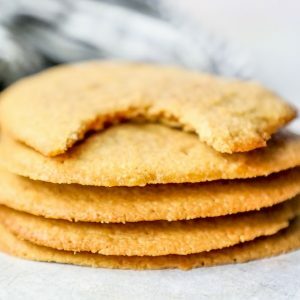 To see more of my favorite Keto Baking Essentials, please head to my Keto Baking Shopping List here. I am a participant in the amazon affiliate advertising program designed to help you find the best products that I use everyday – and I get a small commission at absolutely no extra cost to you! 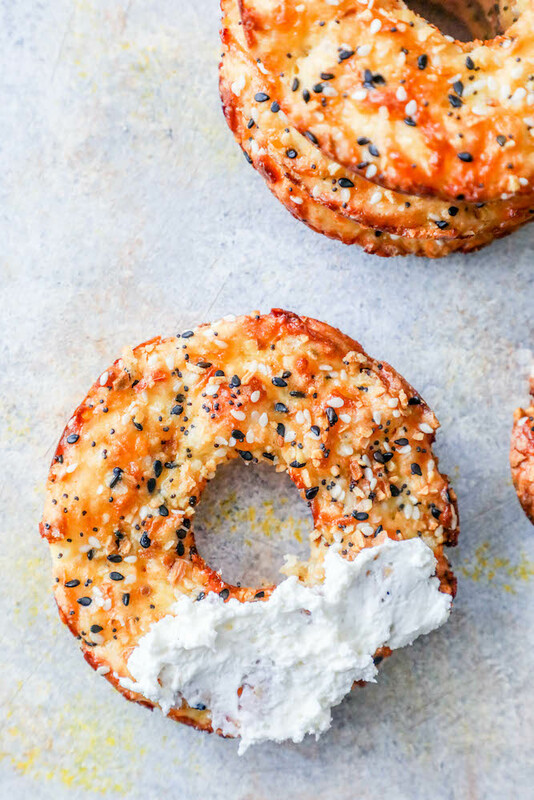 To make these Everything Bagels, you’ll need an Everything Bagel Seasoning mix. You can purchase Everything But The Bagel Seasoning at Trader Joes (watch for sneaky carbs in preservatives if using a pre-made mix), or you can make your own. 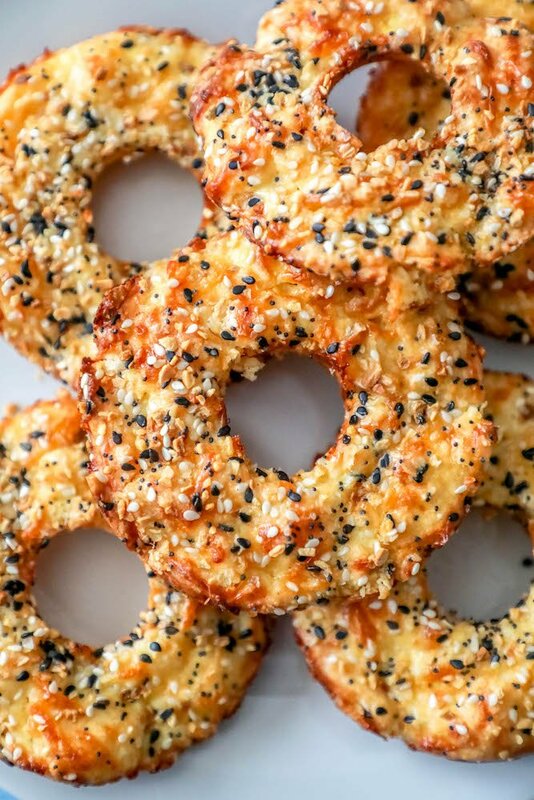 If you’d like to make your own everything bagel seasoning recipe, it is incredibly simple! 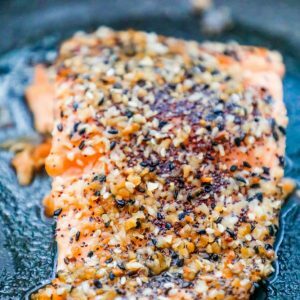 Homemade everything bagel seasoning is great on seafood, vegetables, beef, eggs – and it makes a really fun Christmas gift. In a small bowl, mix all ingredients well. Add seasoning mix to a spice shaker and store in a cool, dry place. 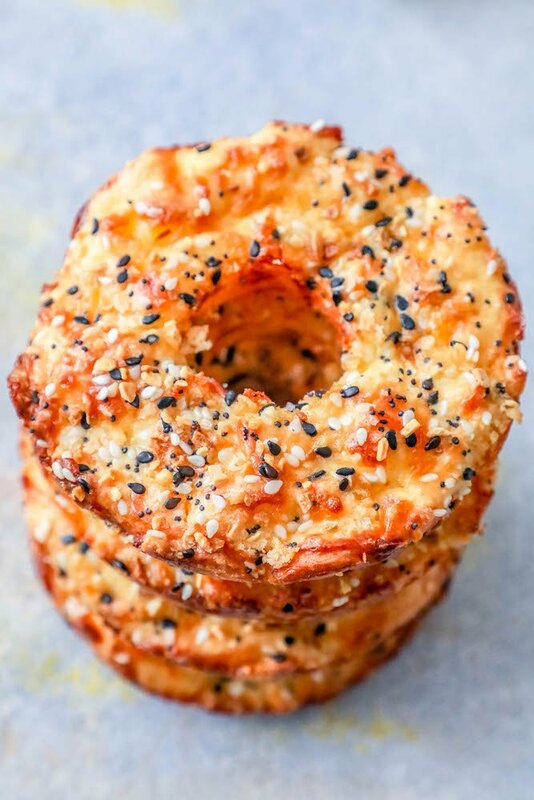 If you love these easy keto everything bagels, be sure to check out some of my other favorite easy keto and low carb dishes! This recipe is really easy, and probably uses things you already have on hand. 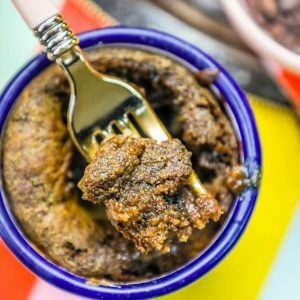 If you’re looking for a list of all of my favorite Keto Baking Essentials, please visit my Amazon Affiliate Page here. I am linking the items in my Amazon profile so you can see the exact ingredients I used, so you can either buy online or have a good idea of what to look for in the grocery store. 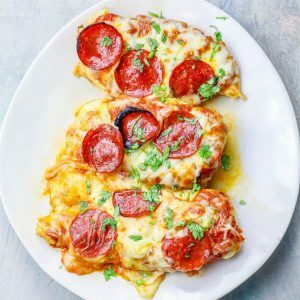 This recipe is really easy to swap out other ingredients (feel free to use any type of hard shredded cheese – like cheddar, monterey jack, mozzarella, etc; and any grated dry cheese like asiago, piave, parmesan) but you want to be sure they have similar moisture contents and consistency for the best results. If you love this easy printable everything bagel recipe as much as I do, please give it five stars and leave a review! 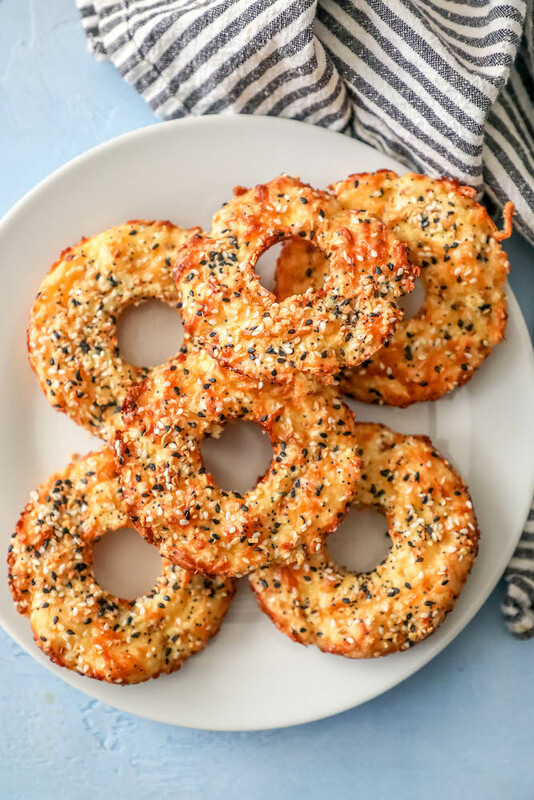 Please help me share on facebook and pinterest with someone you know who is looking for a delicious, easy, keto bagel! Be sure to follow me on social media, so you never miss a post! 1 cup shredded cheese, cheddar, mozzarella, any kind of cheese that melts well. 1/2 cup grated parmesan , or asiago, other hard, dry, grated cheese. Combine the shredded cheese and egg in a bowl and mix it until the ingredients are fully combined. Divide the mixture equally into six parts and press into well greased donut pan. Sprinkle everything bagel seasoning over the tops of the egg and cheese mixture. Bake at 375 degrees for about 15 to 20 minutes until the cheese has fully melted and created a slight brown crust. Feel free to mix up your cheese selection - but stick with one grated hard, dry cheese (like parmesan or asiago) to keep the flour-like texture. This post contains links to Amazon Services LLC. I am a participant in the Amazon Affiliate program – an affiliate advertising program that pays me a small commission for sales at absolutely no extra cost to you – which helps me offset the costs of running Sweet C’s Designs. Do you prefer the silicone pan or the metal one? The silicone is much easier to slide the bagels out of – but you have to be sure to use one that doesn’t leave a rubbery flavor. I have had some that do, and that kills it for me. Just made these and they look and smell amazing. I can not wait for tomorrow morning! Going to top with cream cheese and lox!
. Whipped cream cheese takes them to another level. Now I feel like I’m eating bread again. Thanks again. Hi! I just made these. They smell and look delicious! How do you reheat these? Honestly, while the recipe seems decent, I was getting angrier by the second from all the unnecessary commentary, other links, all the amazon stuff and the amount of scrolling I had to do to finally get down to the recipe. Unpinning this one because I would get a brain aneurysm the next time I have to go through the entire page to reach the recipe. Hey Kris – I hate that you were so inconvenienced by scrolling. I get there is a lot of stuff here – but I try to provide as much information as possible for my readers. I might have a similar brain aneurysm if everyone was so rude and impatient about a post where I’m just trying to be sure you love your meal and have similar ideas (which I am asked for on any recipe I leave them off of). 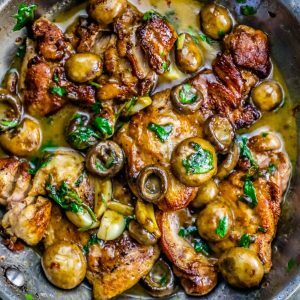 I like this recipe, but I nearly gave up looking for it because of all the links to other posts and products that you shared and used to make these. It was a lot to go through to get to the actual recipe but I’m pinning it anyway because I like it. OMG….these were so good, thanks for sharing the recipe! So I did try these they are good but salty. Amber – I haven’t but I should! The dough’s consistency would make it fall through my air fryer basket (and I am SUPER new to air frying), but if you have a pan it would work! 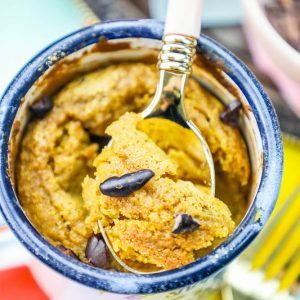 Could you make this sweet instead of savory? My kiddos are in MAD diet for their seizures. The would love a cinnamon/sugar replacement version. Any ideas on how to tweak it to work for that? Thank you! Cindy – because of the parmesan base it might taste a bit funky (though I am going to be trying some sweet versions!) I am testing out a few new recipes with this base this week! I’ll let you know how they turn out. I put cream cheese, stevia, and cinnamon on the bagel as they are and it tasted great! IF you grate really “fresh parmesan” it is a sweeter taste !!! I cannot get past the “soured baby burp-up smell” otherwise….it has to be fresh hard parmesan and it would lend itself to being a sweeter flavored batter. A good Italian Deli should have it. Any suggestions if you don’t need have a donut pan? I have limited storage and don’t really want to buy one if I don’t have to.) Maybe shaped into a bagel shape on a cookie sheet or in a muffin pan? So to be perfectly honest – I often am too lazy to find my donut pan and will just bake them as “biscuits” on a silpat or parchment paper lined baking sheet. Looks a bit different – tastes exactly the same! These are great!! Super easy and delish. Not quite big enough for a sandwich but a fabulous keto snack! Do they need to be stored in the fridge? Thank you! Its not a bagel…its a scrambled egg with cheese and seasonings thrown into a mould. How this is considered a recipe is beyond me. 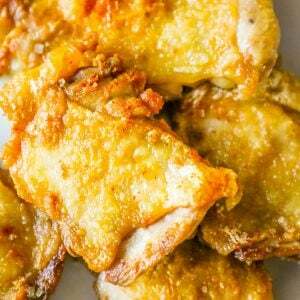 Marina, this is a keto recipe – which means very low carb. This is a replacement for bread for someone who is on a very low carb diet – and the texture is oddly very breadlike even though there is no flour in this dish. But if you’re looking for a traditional bagel, this is absolutely not the right recipe since it is meant to be a diet replacement meal. Can’t wait to try it! I didn’t see the carb count on the nutritional information. ?? Thank you for posting!! Why some people have a compulsive need to be rude to strangers on the internet is beyond me. These were SO good and we’re a nice alternative to the eggs & bacon rut I’ve been in ?. The only thing I’ll do differently next time is make the bagel seasoning without the salt. There was so much salt in the cheese that they were a bit too salty. But I’ll definitely make them again! Thanks for the recipe! I love how you don’t have to miss out on all the favorites anymore! I’m obsessed with Everything Bagels so thank you for bringing them back into my life! I am on the keto diet and yes I miss bagels! Thank you for creating this amazing recipe! These sound delicious! Dangerously good. I love these so much!!! Oops! Re-read and see carbs are less than 1gm per serving.That’s awesome. Hi.. these look so yummy. I don’t see net carbs listed. How many carbs in each ? Ty for sharing. DEFINITELY going to make. We have cut most of the carbs from our diet too, so I’m excited to try these bagels. And of course, I love that everything seasoning!!! I’ve made the keto zuppa toscana soup twice, and let me just say it’s the best soup I’ve ever made, and eaten…and now I will try these bagels to go with it…Thanks for suggesting eating these with the soup! Can’t wait to try them!